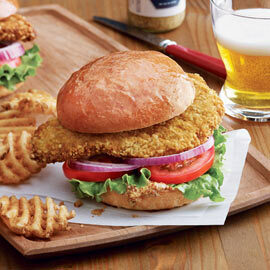 If you've spent any time in the Midwest, you have probably experienced a Breaded Pork Tenderloin. Our pork tenderloins come from the leanest part of the loin, tenderized twice and blanketed with a light batter and cracker-crumb coating. Best if fried in your favorite oil and served with your favorite condiments. For additional tips on preparing your tenderloins, see our cooking and serving instructions.